Based on information from JMA, VRC reported that 67 earthquakes occurred at Mt. Fuji on 30 April, which was the highest number since 53 earthquakes occurred on 18 December 2000. Activity had been relatively low since January 2001. During 3-9 May ~130 predominately low-frequency earthquakes occurred that were located ~15 km beneath an area just NE of the volcano's summit. No other anomalous volcanic activity was observed by NIED. Fuji remains non-eruptive. Fujita and others (2013) investigate the likelihood that Fuji may erupt due to the 2011 E Shizuoka earthquake (M 6) centered on the volcano. Our previous reports of February 2001 (BGVN 26:02) and September 2001 (BGVN 26:09) described the 2000-2001 deep low-frequency (DLF) earthquake swarm under Fuji. In the first section below, we summarize work by Ukawa (2005) and Nakashimi and others (2004) who provide further details and analysis of DLF swarm activity, and discuss midcrustal, low-frequency earthquakes (MLFs) recorded during 1998-2003. Discussion in those papers noted likely molten material at depth below the volcano. The next section reports the stress-field and pressure changes to Fuji's magmatic system due to the 11 March 2011 Tohoko megathrust, an MW 9 earthquake, which created the tsunami that devastated parts of costal NE Honshu including the Fukushima nuclear power plant. In addition, an MW 5.9 aftershock was centered below Fuji. Fujita and others (2013) assessed the possibility that the stress-field and pressure changes could enable magma to escape to the surface. Although they concluded that preexisting faults could rupture the chamber walls, the changes were seemingly insufficient to do so, suggesting no eruption was imminent. Background. During the early 1980s, the National Research Institute for Earth Science and Disaster Prevention (NIED) installed the Kanto-Tokai seismic network in central Japan (figure 2). Later refinements included adding stations SSN and SHJ (not shown), and in the 1990s, stations, FJN, FJY, FJS and FJH, each with three component seismometers and two component tiltmeters at the bottom of 200-m-deep boreholes. 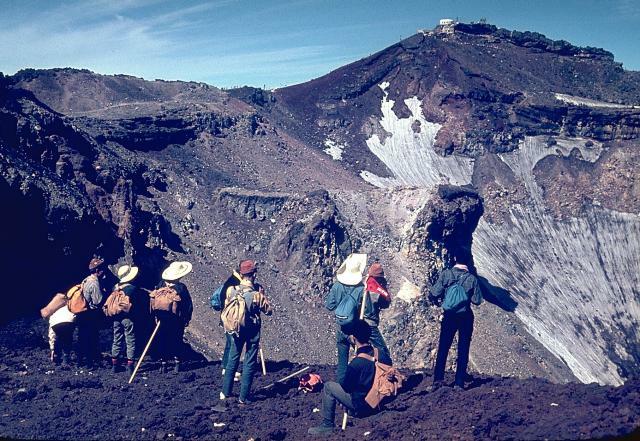 In April 1995, Mt Fuji seismic data recording began using the constellation of stations. Figure 2. (Main map) Mt. Fuji seismic stations shown on a contour map with elevation contours at 500 m intervals. Symbols as follows: crosses, permanent stations maintained by ERI; diamond, Mt. Fuji summit Weather Station maintained since 1987 by JMA; and open circles, stations maintained by NIED. Stations FJH, FJN, FJS and FJY have borehole tiltmeters and 3-component short-period seismometers installed at 200 m depth. (inset map) Tectonic map, with solid lines indicating Eurasian (EUR), N American (NAM) and Philippine Sea (PHS) plate boundaries. Taken from Nakamichi and others, 2004. The Fuji DLF earthquake epicenters were located using 1987 to 2001 data from the early 1980 Kanto-Tokai seismic network and later data taken at the four Fuji stations installed in 1990 (figure 3). Nakamichi and others (2005) reexamined epicenter locations of Ukawa (2004). JMA updated safety and evacuation plans. Figure 3. Cumulative number of DLF events (dotted curve) at Fuji during 1980-2004 and their cumulative wave energy (solid line). Note new instruments and processing accounted for some of the increase seen in 2000-2001 (right of the vertical line), however there was a clear marked increase in events there. After Ukawa (2005). DLFs during 2000-2001. Ukawa (2005) examined the 2000-2001 DLF swarm beneath Fuji. The typical activity here since the early 1980s was 10-20 earthquakes a year at midcrustal depth described as burst-like activity lasting from several minutes to 30 minutes. The cumulative occurrence of DLF earthquakes their associated cumulative wave energy are plotted in figure FUJ2. The cumulative number rate, or the slope of the curve, is almost constant between 1980-1995, followed by several small slope changes before the later months of 2000 due to the improvements in the seismic network and the new data processing system. The sharp increase in 2000-2001 is far larger than the increase due to the enlarged seismic network. In total, 286 events were identified during the eight months from October 2000 to May 2001. The wave energy increased to approximately twice the average recorded during the prior years. Regarding Fuji, Ukawa (2005) notes, "On the basis of the DLF earthquake observations by the NIED seismic network, we investigated the temporal change of their occurrence rate from 1980 to 2003 and the hypocenter locations from 1987 to May 2001. The occurrence rate and the seismic wave energy release rate show an abrupt increase from October 2000 to May 2001, suggesting a change in the environment. ...Relocation of hypocenters of the DLF earthquakes indicates that hypocenters of the DLF earthquakes cluster mainly in an elongated region measuring 5 km along the long axis in a NW-SE direction, the center of which is located about 3 km NE from the summit. In addition to the main cluster, hypocenters extend to the southwest from the summit. During the swarm activity in 2000 to 2001, activity in the primary hypocenter region on the northeastern side of Mount Fuji increased greatly. The focal depths of well located DLF events range from 10 to 20 km. The sharp increase of DLF earthquake activity at Mount Fuji began soon after magma discharge and intrusion events in the Miyake-jima and Kozu-shima region in July and August 2000. These events may have modified the state of the deep magmatic system beneath Mount Fuji, thus triggering the DLF earthquake swarm." Figure 4 shows the three volcanoes mentioned above: Fuji, Miyake-jima, and Kozu-shima. Several more volcanoes also of Holocene age did not erupt. Figure 4. Ukawa (2005) noted the 2000-2001 DLF swarm beneath Fuji occurred soon after the July-August 2000 magma discharge and intrusion events located at Kozu-shima and Miyake-jima. Those two volcanoes are located in the Pacific ~135 km from Fuji. Fuji did not erupt. The yellow triangles show locations of other Holocene volcanoes listed in the GVP database. Like Fuji, these also did not erupt. Base map courtesy of the Microsoft Corporation with labels by BGVN editors. MLF earthquakes during 1998-2003. Nakamichi and others (2004) revisited Fuji MLF data, that like the DLFs of 2000-2001, they also clustered near the summit. "We have determined the hypocenter locations of MLFs using the hypoDD program [a double-difference algorithm; Waldhauser and Ellsworth, 2000] and repicked arrival times from the seismic networks of ERI, JMA and NIED in and around Mt. Fuji between 1998 and 2003 including the active periods from September 2000 to May 2001, [figure 5]". Figure 5. Comparison between the Fuji hypocenters of the MLFs by Nakamichi and others (2004) (red circles) and the routine processing at NIED (black circles). (a) Map view of hypocenters, (b) E-W cross-section, and (c) N-S cross-section. Taken from Nakamichi and others (2004). The authors summarized their results as follows: "(1) Hypocenters of MLFs define an ellipsoidal volume, 5 km in diameter ranging from 11 to 16 km in focal depth. (2) This volume is centered at 3 km NE of the summit and its long axis is trending NW. This orientation coincides with the major axis of tectonic compression around Mt. Fuji. (3) The center of the MLF epicenters migrated upward and 2-3 km from SE to NW in 1998-2001." Nakamichi and others, (2004) continue, "We interpret that the hypocentral migration of MLFs reflects magma movement associated with a NW-SE oriented dike beneath Mt. Fuji, figure 6. The relative error ranges of the hypocenters relocated here are from 100 to 500 m horizontally and from 200 to 700 m vertically. No elongated structure in the direction of the observed NW- SE strike is observed in the simulations, indicating that the observed strike is not an artifact of the relocation procedure [seen in Figure 6b along the plane A-A']. The extent of this depth range is also supported by the spread in S-P readings for individual earthquakes. S-P arrival time differences for well-recorded MLFs at station KMR range from 1.9 to 2.4 s, verifying that MLFs beneath Mt. 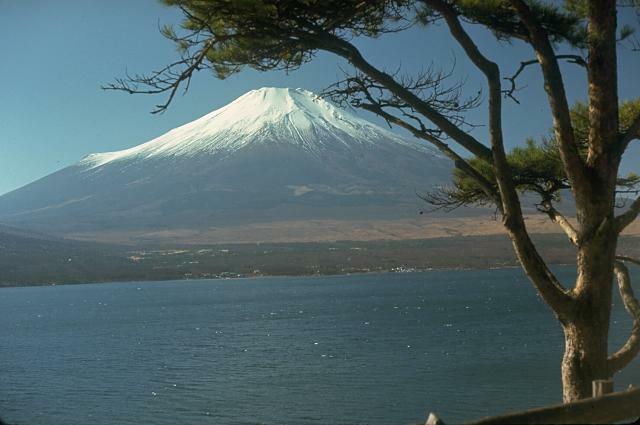 Fuji span a depth range of at least 4 km, and are not confined to a very small volume." Figure 6. Hypocentral distributions of the Fuji MLFs, as determined by the hypoDD program. (a) Map view of relocated hypocenters. Hypocenters at the intersection of A-A' with B-B' shown enlarged as a circle above and to the right. (b) Cross-section A-A'. (c) Cross-section B-B'. Cross-sections A-A' and B-B' include earthquake hypocenters projected from up to 10 km on either side of the cross section line. Taken from Nakamichi and others, 2004. The MLFs also shifted with time. The spatial and temporal variations of MLF hypocenters plotted on figure 7. Nakamichi and others (2004) observed focal depths of MLFs in 1998- 1999 that were 12-16 km deep and "seemed to move deeper gradually." Figure 7. Spatial and temporal variations of the Fuji hypocenters of 1998-2003 MLFs. Top plot records distances from hypocenters on the NW-SE horizontal plane projected to zero on the line A-A' of Figure 6. Bottom plot records focal depths vs. time projected to the vertical plane through A-A'. Some or all these variations were interpreted as a manifestation of magma recharge and migration. Nakamichi and others, 2004. Two key points from Nakamichi and others (2004) were (1) the MLF processing indicated that the hypocenters migrated 2-3 km upward during 1998-2001, and (2) they interpreted the MLF hypocenter migration as reflecting magma movement associated with a NW-trending dike beneath Fuji. 2011 Fuji stress change after the MW 9 Tohoko earthquake. Fujita and others (2013) studied the Tohoko earthquake and aftershocks in order to see whether the changes in the stress field and pressure changes would cause the known active magma system to erupt. The Tohoku earthquake, MW~9, struck on 11 Mar 2011. Extension occurred over a wide region of the Japanese mainland (Fujita and others, 2013). Aftershocks included those at N Nagano (MW 6.3) on 12 March, at E Shizoka (MW 5.9) on 15 March, and at N Ibaraki (MW 5.8) on 19 March, figure 8. The E Shizuoka aftershock struck beneath Fuji's S flank above its magma system. Fujita and others (2013) selected parameters of the two highest magnitude Tohoko earthquakes from Ozawa et al. (2011) plus the E. Shizuoka earthquake to investigate the change below Fuji. 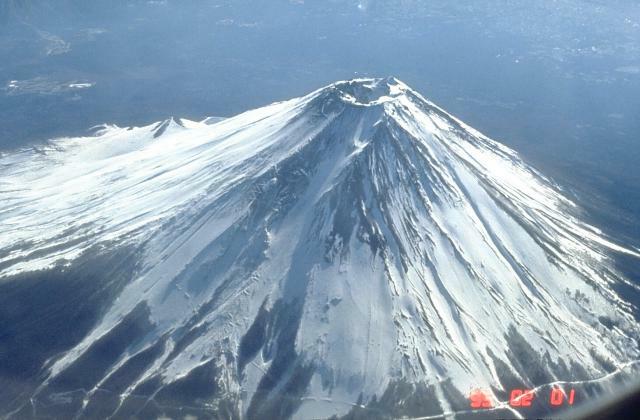 Using seismic data and later modeling they found the change in static pressure below Fuji insufficient to cause an eruption. Figure 8. A map showing Fuji on Honshu Island with a 500 x 200 km box enclosing the epicenters in the main sequence of the Tohoko megathrust earthquake. Epicenters of key aftershocks are shown as blue stars and one green star. The later struck 15 March, 4 days after the main event at 7-12 km depth below Fuji. After Fujita and others, 2013. The fault parameters of the Tohoko earthquakes (Table 3) were estimated by Ozawa and others (2011). With regard to the E Shizouka earthquake, Fujita and others (2013) determined the East Shizuoka source fault using the method of Ueda and others (2005) and "determined the best-fit fault model to be almost strike-slip with some reverse components, located a few kilometers south of the summit trending from depths of 7-12 km." Note that on table 3 the "Depth (top)" value of 7 km locates the top of the fault. Table 3. Fault parameters computed for two of the strongest Tohoku earthquakes and the E Shizuoka aftershock. Tohoku parameters are from Ozawa and others (2011); those for the E Shizuoka were obtained by applying the method of Ueda and others (2005). Taken from Fujita and others (2013). Figure 9 shows the distribution of hypocenters of both tectonic (blue) and DLP (red) earthquakes during 1996-2011. Tectonic earthquakes occurring during 1996-2011 (blue circles) cluster to the S at ~5-15 km depth and NE from ~17 km deep to below the 25 km scale limit with little temporal change in number until a detectable rate rise in early 2011. Hypocenters of DLFs occurring during 1996-2011 (red circles) cluster nearest the crater N at ~10-15 km depth with little temporal change in number until a detectable rate rise in early 2011. The largest event shown, the E Shizuoka tectonic earthquake (15 March 2011) occurred on the S flank of Mount Fuji at a depth of 12 km (table 3 lists the top of the fault at 7 km). Remote aftershocks were centered a few kilometers N of the summit. Taken from Fujita and others (2013). Figure 9. Mt Fuji summit, yellow triangle, shown with tectonic and DLF earthquakes during 1996 to 2011. Red circles correspond to hypocenters of Deep Long Period (DLP) events, and blue circles correspond to tectonic earthquakes. Note the DLP increase in 2000 and 2001, shortly after the Miyake-jima volcano eruption and huge ground deformation on Izu peninsula ~100 km SE of Mount Fuji. Courtesy of Fujita and others (2013). The relocated hypocenters computed by Fujita and others (2013) compared to the hypocenters of the same events routinely obtained by NIED (Ukawa, 2001), showed improvement in location accuracy (figure 10). The hypocenters by NIED are distributed in a larger volume and not along a particular plane while in this study they are much more concentrated and trending NNE. As seen on figure FUJ 9, Fujita and others (2013) noted "The dislocation was 86 cm toward the NNE with a strike of 240, dip of 800, and rake of 200." Aftershocks of the E Shizouka earthquake also occurred along this fault." Figure 10. Topographic station location map of Fuji showing an estimated dislocation of 86 cm along a 6x6 km fault plane based on GPS data from NIED and Graphical Survey Institute (GEONET) data. Observed (red) and calculated (blue) displacement vectors are shown. Courtesy of Fujita and others (2013). The static stress change caused by the E Shizouka earthquake was on the order of 0.1-1 MPa, or 0.2%, at the boundary of the magma reservoir, which was theoretically sufficient to trigger an eruption (Walter and others 1997; Walter and others 2009). The deformation of Fuji's magma system was based on finite-element modeling of the Japanese mainland and Fuji seismic tomography. At Fuji, the stress changes to the magma reservoir were on the order of 0.001-0.01 MPa for the Tohoku earthquake and 0.1-1 MPa for the East Shizuoka earthquake (Fujita and others, 2013). Were these static stress changes sufficient to promote new fractures at the magma reservoir wall and magma injection? Fujita and others, 2013 maintain, "This is less than the magnitude required to break new faults but could trigger some perturbation in unstable faults or in the hydrothermal and magmatic systems. However, the magma beneath Mount Fuji does not seem to have enough potential to erupt at this moment". References. Fujita, E., Kozono, T., Ueda, H., Kohno, Y., Yoshioka, S., Toda, N., Kikuchi, A., and Ida, Y. 2013, Stress field change around the Mount Fuji volcano magma system caused by the Tohoku megathrust earthquake, Japan. Bulletin of Volcanology, 75(1), 1-14. Koyama M., 2002, Mechanical coupling between volcanic unrests and large earthquakes: a review of examples and mechanics. J Geogr 111:222-232, in Japanese with English abstract. Koyama M., 2007, Database of eruptions and other activities of Fuji Volcano, Japan, based on historical records since AD 781. Yamanashi Institute of Environmental Sciences, Fuji Volcano, pp 119- 136, in Japanese with English abstract. Nakamichi H., Ukawa, M., Sakai S., 2004, Precise hypocenter locations of midcrustal low-frequency earthquakes beneath Mt. Fuji, Japan, Earth, Planets and Space, 56, e37-e4. Nakamichi, H., Hamaguchi , H. Tanaka S., Ueki S., Nishimura T., Hasegawa A., 2003, Source mechanisms of deep and intermediate-depth low frequency earthquakes beneath Iwate volcano, northeastern Japan, Geophysical Journal International, 154, 811-828. Nishimura T., Ozawa S., Murakami M., Sagiya T., Tada T., Kaidzu M., Ukawa M., 2001, Crustal deformation caused by magma migration in the northern Izu Islands, Japan. Geophysical Research Letters 28:3745-3748. Ozawa S., Nishimura T., Suito H., Kobayashi T., Tobita M., Imakiire T., 2011, Coseismic and postseismic slip of the 2011 magnitude-9 Tohoku-Oki earthquake. Nature 475:373-377. Ueda H., Fujita E., Ukawa M., Yamamoto E., Irawan M., Kimata F., 2005, Magma intrusion and discharge process at the initial stage of the 2000 activity of Miyakejima, Central Japan, inferred from tilt and GPS data. Geophysical Journal International 161:891-906. Ukawa, M., 2005, Deep low-frequency earthquake swarm in the mid crust beneath Mount Fuji (Japan) in 2000 and 2001, Bulletin of Volcanology, 68 (2005), pp. 47-56. Waldhauser, F. and W. L. Ellsworth, 2000, A double-difference earthquake location algorithm: Method and application to the northern Hayward fault, California, Bull. Seismol. Soc. Am., 90, 1353-1368. Walter T., 2007, How a tectonic earthquake may wake up volcanoes: stress transfer during the 1996 earthquake-eruption sequence at the Karymsky Volcanic Group, Kamchatka. Earth and Planetary Science Letters 264:347-359. Walter T., Amelung F., 2007, Volcanic eruptions following M≥9 megathrust earthquakes: implications for the Sumatra-Andaman volcanoes. Geology 35:539-542. Walter, T., Wang, R., Zimmer, M., Grosser, H., Luhr, B., and Ratdomopurubo, A., 2007, Volcanic activity influenced by tectonic earthquake: static and dynamic stress triggering at Mt. Merapi. Geophysical Research Letters 34:L05304. Walter, T., Wang, R., Acocella, V., Neri, M., Grosser, H., and Zschau, J., 2009, Simultaneous magma and gas eruptions at three volcanoes in southern Italy: an earthquake trigger? Geology 37:251-254. Information Contacts: National Research Institute for Earth Science and Disaster Prevention (NIED), 3-1 Tennodai, Tsukuba-shi, Ibaraki-ken, 305, Japan (URL: http://www.bosai.go.jp); Japan Meteorological Agency (JMA), Volcanological Division, 1-3-4 Ote-machi, Chiyoda-ku, Tokyo 100, Japan (URL: http://www.jma.go.jp/); Volcano Research Center, Earthquake Research Institute (ERI), University of Tokyo, Yayoi 1-1-1, Bunkyo-ku, Tokyo 113-0032, Japan (URL: http://www.eri.u-tokyo.ac.jp/VRC/index_E.html). According to a Reuters article from 29 January, the high number of low-frequency earthquakes that were recorded at Fuji over the past several months (133 in October, 222 in November, and 144 in December) decreased to 36 in January. Several news reports have noted abnormally high earthquake activity during the past several months at Fuji. Usually 1 to 2 low-frequency earthquakes per month are recorded; but recent monthly counts were 35 for September 2000, 133 for October, 222 for November, and 143 for December. No other measured parameters changed at the volcano. While the earthquake counts are abnormally high, scientists do not believe that they are indicative of an imminent eruption. The volcano is being carefully monitored. About nine small earthquakes of M < 2 occurred beneath the summit 20 August-1 September. Four were felt at intensities of I-III (JMA scale) by personnel at the summit meteorological observatory, but were not felt at the weather station 19 km ESE of the summit. Seismographs confirmed that the earthquakes originated just underneath the summit. JMA installed a portable seismograph at the summit on 25 August. The strongest earthquake, on 20 August at 0556, had a magnitude of 1.8 (table 1). No signs of wall collapse or landslides were observed by a field survey group around the summit that day. Earthquakes on 20 and 24 August were recorded by the Univ of Tokyo's Earthquake Research Institute seismographs within 20 km of the summit. Table 1. Earthquakes at Mt. Fuji, 20 August-1 September 1987. 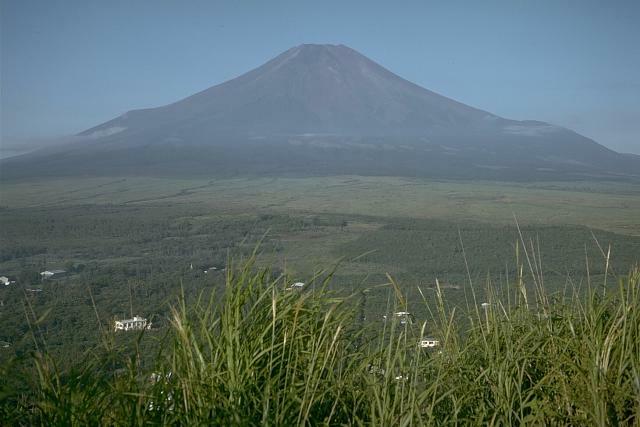 Small earthquakes are not rare at Fuji, but because the earthquakes occurred in the summit region during the height of the climbing season, there was some concern among government officials. However, the relatively sharp P-wave arrivals suggest that the earthquakes were tectonic in origin. Information Contacts: Yoshiaki Ida and Harry Glicken, Earthquake Research Institute, Univ of Tokyo; JMA. On 20, 24, 25, and 30 January about a dozen low-frequency earthquakes were recorded. According to the Japan Meteorological Agency (JMA), a relatively large number of low-frequency, low-magnitude earthquakes have occurred at ~15 km depth below Fuji volcano since September 2000 (table 2, figure 1). For comparison, during recent years before this spike, the number of earthquakes had averaged only 1-2 per month. The maximum earthquake magnitude during September 2000-January 2001 was M 2.2, recorded on 11 October. During November-December earthquakes with M > 2.0 occurred 7 times. Earthquake hypocenters were generally located below an area NE of the summit. Geodetic parameters measured by GPS, EDM, and tilt-meters did not escalate. Located 150 km W of Tokyo, Fuji's close proximity encouraged the installation of enhanced instrumentation in order to better monitor the volcano. Previous seismic swarms at Fuji in 1987 and 1996 (SEAN 12:08 and BGVN 21:02) had lower event counts than the current episode. Table 2. Seismic events registered at Fuji during September 2000-January 2001. Data courtesy of JMA and Reuters. Figure 1. Latitude, longitude, depth, and magnitude of seismicity at Fuji during September 2000-February 2001. Earthquake cross-sections are shown in N-S (upper right) and E-W (bottom) planes. Figure by Shin-ichi Sakai; courtesy of Setsuya Nakada (VRC-ERI). Information Contacts: National Research Institute for Earth Science and Disaster Prevention, 3-1, Tennodai, Tsukuba-shi, Ibaraki-ken, 305, Japan (URL: http://www.bosai.go.jp/); Setsuya Nakada, Hidefumi Watanabe, and Shin-ichi Sakai, Volcano Research Center, Earthquake Research Institute, University of Tokyo, Yayoi 1-1-1, Bunkyo-ku, Tokyo 113-0032, Japan (URL: http://www.eri.u-tokyo.ac.jp/VRC/index_E.html); Japan Meteorological Agency, Volcanological Division, 1-3-4 Ote-machi, Chiyoda-ku, Tokyo 100, Japan (URL: http://www.jma.go.jp/); Reuters (URL: http://www.reuters.com/). 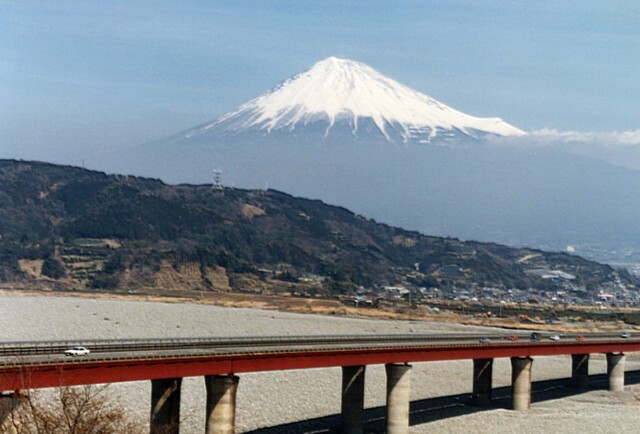 Earthquakes increased at Fuji during April-May 2001. According to the Japan Meteorological Agency 67 earthquakes were detected on 30 April. This was the highest daily number since the 53 that occurred on 18 December 2000, even though seismic activity had been relatively low since the beginning of the year. During the week of 3-9 May 2001 the number of weekly earthquakes was as high as 130. Since September 2000 most of the earthquakes were of low magnitude and low frequency. Their hypocenters were NE of the summit at ~15 km depth. The monitoring system of National Research Institute for Earth Science and Disaster Prevention had not detected any other anomalous signs. Information Contacts: National Research Institute for Earth Science and Disaster Prevention, 3-1 Tennodai, Tsukuba-shi, Ibaraki-ken, 305, Japan (URL: http://www.bosai.go.jp/); Setsuya Nakada, Hidefumi Watanabe, and Shin-ichi Sakai, Volcano Research Center, Earthquake Research Institute, University of Tokyo, Yayoi 1-1-1, Bunkyo-ku, Tokyo 113-0032, Japan (URL: http://www.eri.u-tokyo.ac.jp/VRC/index_E.html); Japan Meteorological Agency, Volcanological Division, 1-3-4 Ote-machi, Chiyoda-ku, Tokyo 100, Japan (URL: http://www.jma.go.jp/). The conical form of Fujisan, Japan's highest and most noted volcano, belies its complex origin. 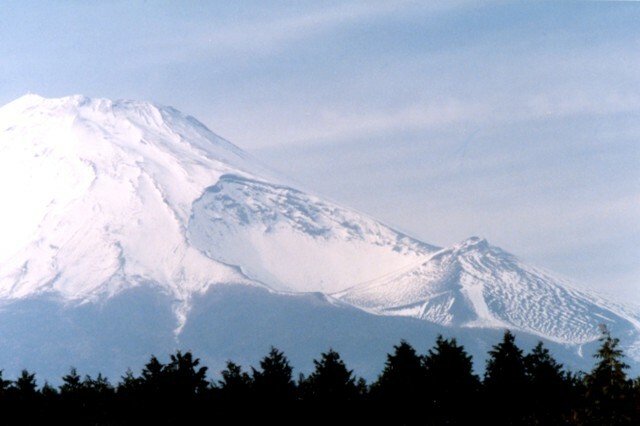 The modern postglacial stratovolcano is constructed above a group of overlapping volcanoes, remnants of which form irregularities on Fuji's profile. Growth of the Younger Fuji volcano began with a period of voluminous lava flows from 11,000 to 8000 years before present (BP), accounting for four-fifths of the volume of the Younger Fuji volcano. Minor explosive eruptions dominated activity from 8000 to 4500 BP, with another period of major lava flows occurring from 4500 to 3000 BP. Subsequently, intermittent major explosive eruptions occurred, with subordinate lava flows and small pyroclastic flows. Summit eruptions dominated from 3000 to 2000 BP, after which flank vents were active. The extensive basaltic lava flows from the summit and some of the more than 100 flank cones and vents blocked drainages against the Tertiary Misaka Mountains on the north side of the volcano, forming the Fuji Five Lakes, popular resort destinations. The last confirmed eruption of this dominantly basaltic volcano in 1707 was Fuji's largest during historical time. It deposited ash on Edo (Tokyo) and formed a large new crater on the east flank. This volcano is located within the Fujisan, sacred place and source of artistic inspiration, a UNESCO World Heritage property. Chiba T, Tomita Y, Suzuki Y, Arai K, Fujii N, Miyaji N, Koizumi S, Nakashima K, 2007. Analysis of micro topography of the Aokigahara Lava flows, Fuji volcano, by the Light Detection and Ranging System. In: Aramaki S, Fujii T, Nakada S, Miyaji N (eds), Fuji volcano. Yamanashi Inst Environ Sci, p 349-363. Kaneko T, Yasuda A, Fujii T, Yoshimoto M, 2010. Crypto-magma chambers beneath Mt. Fuji. J. Volcanol. Geotherm. Res., 193: 161-170. Koyama M, 1998. Reevaluation of the eruptive history of Fuji volcano, Japan, mainly based on historical documents. Bull Volc Soc Japan (Kazan), 43: 323-347 (in Japanese with English abs). Koyama M, 1998. Reevaluation of the 800-802 eruption of Fuji volcano, Japan, and its influence on the ancient traffic network around the volcano, based on eruptive deposits and historical records. Bull Volc Soc Japan (Kazan), 43: 349-371 (in Japanese with English abs). Machida H, 1967. The recent development of the Fuji volcano, Japan. Tokyo Metropolitan Univ Geog Rpt, 2: 11-20. Miyaji N, 1988. History of Younger Fuji volcano. J Geol Soc Japan, 94: 433-452 (in Japanese with English abs). Miyaji N, 2002. The 1707 eruption of Fuji volcano and its tephra. Global Environ Res, 6(2): 37-39. Miyaji N, Endo K, Togashi S, Uesugi Y, 1992. Tephrochronological history of Mt. Fuji. 29th Internatl Geol Cong, Kyoto, Field Trip, C12: 75-109. Miyaji N, Togashi S, Chiba T, 2004. A large-scale collapse event at the eastern slope of Fuji volcano about 2900 years ago. Bull Volc Soc Japan (Kazan), 49: 237-248 (in Japanese with English abs). Tsuya H, 1955. Geological and petrological studies of volcano Fuji. Part 5: on the 1707 eruption of volcano Fuji. Bull Earthq Res Inst, Univ Tokyo, 33: 341-383. Tsuya H, Machida H, Shimozuru D, 1988. Geologic map of Mt. Fuji. Geol Surv Japan, geol map and 24 p text, 2nd printing. Watanabe S, Widom E, Ui T, Miyaji N, Roberts A M, 2006. The evolution of a chemically zoned magma chamber: the 1707 eruption of Fuji volcano, Japan. J. Volcanol. Geotherm. Res., 152: 1-19. Yamamoto T, Takada A, Ishizuka Y, Miyaji N, Tajima Y, 2005. Basaltic pyroclastic flows of Fuji volcano, Japan: characteristics of the deposits and their origin. Bull Volcanol, 67: 622-633. There is data available for 67 Holocene eruptive periods. [ 1770 Sep 16 ] [ Unknown ] Uncertain South flank? 0999 Mar Unknown Confirmed 2 Historical Observations South flank ? There is no Deformation History data available for Fujisan. There is no Emissions History data available for Fujisan. 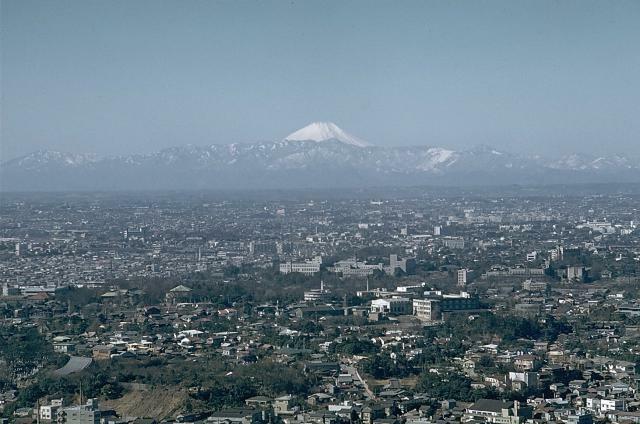 Snow-capped Mount Fuji rises above mountains at the SW end of the Kanto plain in this view from Tokyo Tower. Ash fell on the ancient capital of Edo (Tokyo), 100 km to the NE, during the last eruption of Fuji in 1707. This was the largest eruption from Fuji during historical time. In summer Mount Fuji sheds its more familiar winter blanket of snow and exposes a colorful mantle of oxidized scoria and lava flows above its timberline. 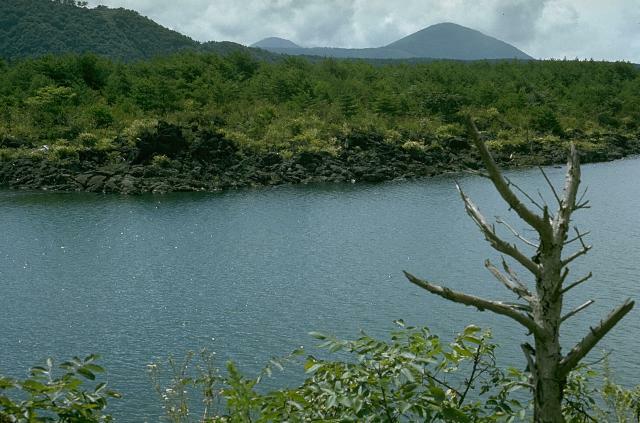 The two shoulders on the lower flanks, in this view from the north near Lake Yamanaka, are remnants of a group of older volcanoes over which the modern symmetrical volcano was constructed. The left-hand shoulder is a remnant of Ko-Fuji (Old Fuji) volcano, and the broader right-hand shoulder is a segment of Komitake, an earlier mid-Pleistocene volcano. Photo by Lee Siebert, 1970 (Smithsonian Institution). Mount Fuji provides a backdrop to a fireworks display at Lake Yamanaka, one of five lakes at the northern base of the volcano. 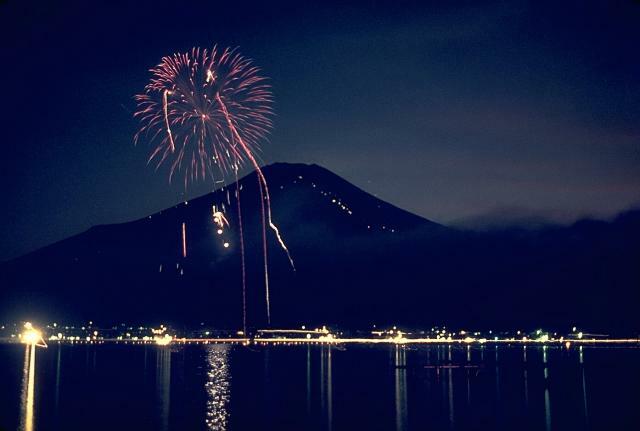 Resort towns around the volcano sponsor summer festivals featuring elaborate displays of "hanabi" (fireworks). The line of diagonal lights extending up the right-hand side of Fuji-san are mountain huts along the ten stations of the Fuji-Yoshida climbing route, the most popular of the six major summer ascent routes. 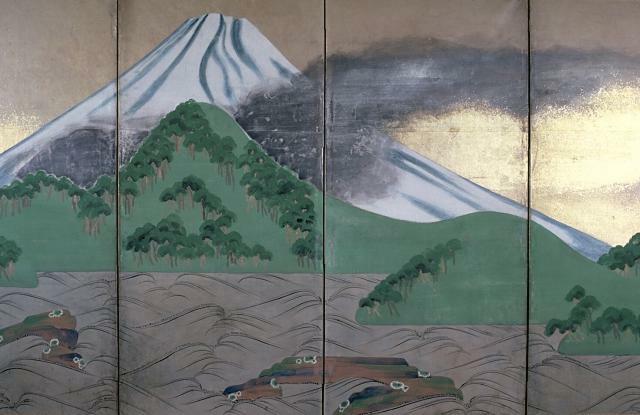 A contemporary folding screen by Ogata Korin correctly depicts the last eruption of Mount Fuji, in 1707, as originating from a flank vent. The dark area on the lower SE (left) flank is Hoei crater, the vent of the 1707 eruption; the ash plume is blown to the NE. The major explosive eruption was continuous during December 16-20, and intermittent until February 1708. Ashfall from this eruption, the largest from Fuji-san in historical time, reached the capital city of Edo (Tokyo). Secondary mudflows damaged houses and agricultural land. Photo by Chip Clark, Smithsonian Institution (courtesy of Robert Simmons). 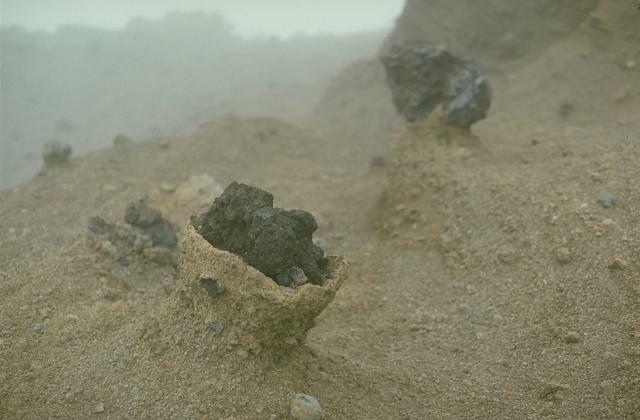 Volcanic bombs ejected during the latest eruption of Mount Fuji in 1707 lie on pedestals of light-colored tephra from the older Ko-Fuji volcano. These blocks, about 30 cm in diameter, impacted the surface of the older tephra deposits near the rim of the 1707 Hoei crater. Erosion by strong winds removed the softer, hydrothermally altered tephra, leaving the blocks standing above the surface. This entire flat forested plain, known as Aokigahara ("Blue Tree Plain") is underlain by a single massive lava flow from Mount Fuji. A major explosive and effusive eruption began in June 864 CE from Nagao-yama, a vent on the NW flank. Lava flowed into lakes Motosu and Senoumi, destroying lakeshore farm houses. It divided Lake Senoumi into the two present-day lakes of Shoji-ko (seen here in the distance against a Tertiary mountain range to the NW) and Sai-ko. The Aokigahara Marubi lava field covered an area of 32 sq km. This lava flow on the shore of Sai-ko lake and the flat plain beyond it are part of a single massive lava flow erupted from Nagao-yama on the NW flank of Mount Fuji in 864 CE. 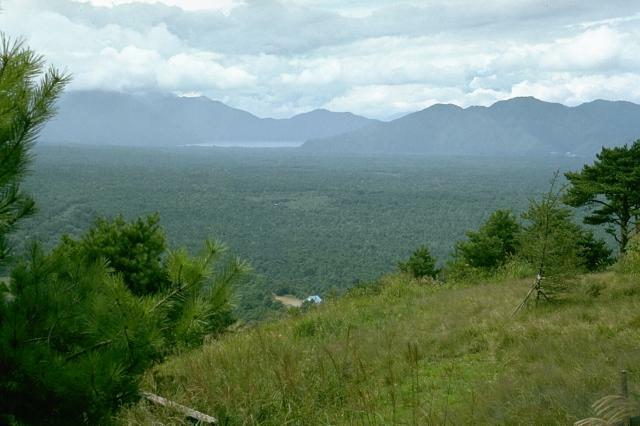 The 32 sq km lava was responsible for the present morphology of Sai-ko lake, which was formed when the lava flow split a former larger lake in two. The cinder cone on the horizon is Omuro-yama, the largest flank cone of Mount Fuji. It was formed during an eruption about 2900 years ago. Climbers peer into the 700-m-wide summit crater of Mount Fuji from its east rim. Fuji-san is perhaps the world's most frequently climbed major volcano; more than a hundred thousand people ascend its slopes yearly during the 2-month summer climbing season. A white meteorological observatory (upper right) lies at the 3776-m-high summit of the volcano, which is 240 m above the crater floor. An oxidized scoria layer that caps the rim of the summit crater and gives the upper part of Mount Fuji a reddish hue was erupted about 2100 years ago. Snow-capped Mount Fuji towers above Lake Yamanaka, one of the Fujigoko, the "Five Lakes of Fuji." The lakes, popular tourist destinations from Tokyo, were formed when lava flows from Fuji-san blocked drainages against a Tertiary mountain range to the north. The knob at the snowline on the left is Hoei-san, a remant of Ko-Fuji (Old Fuji), one of several older volcanoes above which the modern volcano was constructed. The latest eruption of Fuji, in 1707, took place from a new SE-flank crater just below Hoei-san. Winter snows cover the slopes of Mount Fuji, Japan's highest and most renowned volcano. A 700-m-wide crater caps the 3776-m-high stratovolcano. The modern symmetrical cone is constructed over a group of overlapping volcanoes, a remnant of which, Hoei-san, forms the knob halfway down the SE (left) flank. The diagonal line at the lower right is a toll road that extends to timberline on the north flank. Historical eruptions have been recorded since the 8th century, the latest in 1707. Photo by Tom Pierson, 1995 (U.S. Geological Survey). Snow-capped Mount Fuji towers above the major Tokyo-Osaka highway that skirts the coast of the Pacific Ocean in southern Shizuoka Prefecture. The symmetrical profile of the 3776-m-high volcano is interrupted by the knob on the right (SE) flank just above the cloud bank. This is Hoei-san, a remant of Ko-Fuji (Old Fuji), an ancestral volcano that preceded the construction of the modern edifice. The large crater in the center of the photo was produced on the SE flank of Mount Fuji during the 1707-1708 eruption. This major explosive eruption, one of the largest in Japan during historical time, ejected more than 1 cu km of tephra and caused ashfall in the capital city of Edo (Tokyo). Three craters were formed sequentially along a NW-SE-trending fissure radial to the summit. The primary vent of the eruption was the upper crater (center), which is 1500 m by 750 m in diameter and 750 m deep from the highest point on the crater rim. The following 28 samples associated with this volcano can be found in the Smithsonian's NMNH Department of Mineral Sciences collections, and may be availble for research (contact the Rock and Ore Collections Manager). Catalog number links will open a window with more information. Large Eruptions of Fujisan Information about large Quaternary eruptions (VEI >= 4) is cataloged in the Large Magnitude Explosive Volcanic Eruptions (LaMEVE) database of the Volcano Global Risk Identification and Analysis Project (VOGRIPA).